We do all kinds or framing for all kinds of items. This is just a small sample of some of the items we have framed. This Custom Frame for a 60" Plasma T.V. consists of a 4" wide moulding, a 1 1/2" inner liner frame, and a 1/2 inner lip. An additional 8" extension was added to the sides of the frame and 4" sides were added to the top and bottom of the frame to allow for air flow through the back. The extensions were then custom finished to match the original moulding for a truly custom look. The entire frame was then mounted to the wall over the TV for a flush fit against the wall. 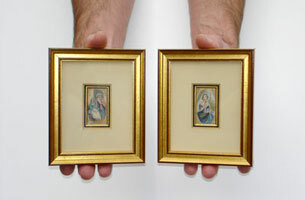 Hand painted miniature portraits. Framed with a linen covered mat with gold filet and matching gold guilded frame. Approximate size 4" x 5" each. 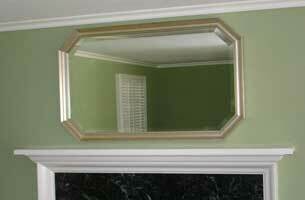 1 1/2" beveled mirror custom framed in a silver leaf octagon frame. Approximate size 38" X 58". 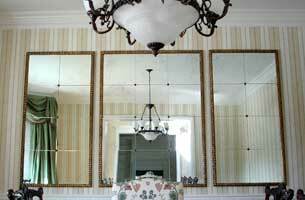 Each 15" X 15" mirror panel were mounted and framed with decorative buttons added to the intersections. Finished sizes approximately 30" X 60" and 45" X 60". This 50 " Plasma T.V. was framed with a custom routed 4" wide moulding. The additional routing increases the lip size, covering more of the outer area of the T.V. This gives the T.V. a more finished look and adds warmth and elegance to the entire room. 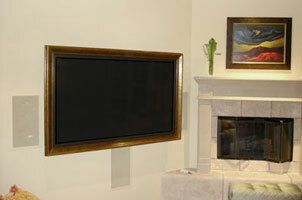 The frame was custom mounted over the T.V. Antique mirror with a 1" antique mirror inlay. Framed with a 4" frame and a 1" inner liner. Approximate size 48" X 58". 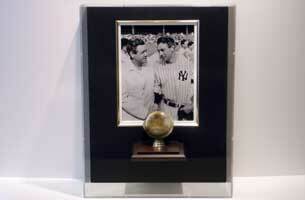 Baseball signed by Babe Ruth, mounted on a custom gold glove mount and wood base. Photograph inset in black fabric backing with inner gold lip liner. Enclosed in a 6" deep plexiglass case. Approximate size 16" X 22". 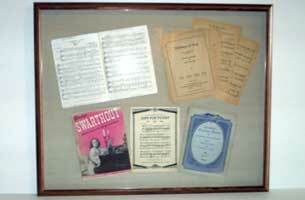 Various items mounted in a shadowbox with a custom engraved brass plaque added for presentation. 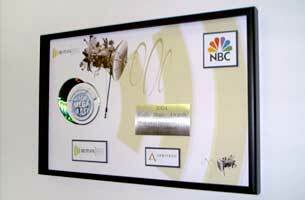 1 of 46 that were presented at the Radio Music Awards held in Las Vegas in 2004. Approximate size 16" X 24". 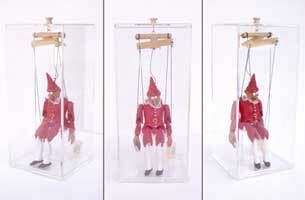 Handmade ceramic marionette puppet enclosed in a plexiglass case with a 1" thick base. Approximate size 10" X 10" X 24". 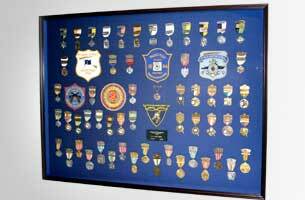 Vintage collection of 56 medals and awarded patches for shooting skill and marksmanship mounted on a blue fabric backing and framed in a 1 1/2" deep shadowbox frame. Approximate size 35" X 42". Sheet music collection archive mounted on silk fabric and framed in a shadowbox with ultraviolet-filtering plexiglass to arrest paper decay. Approximate size 32" X 42". Guitar and CD's with cases, custom mounted on black fabric and enclosed in a 4" deep plexiglass case. A custom presentation plaque was also added. Approximate size 24" X 46". 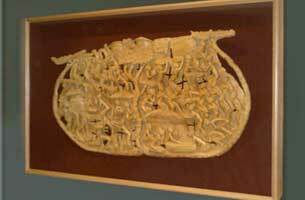 Hand-carved wood piece from Asia, custom mounted on a burgundy suede fabric and framed in a 3" deep shadowbox. Approximate size 28" X 40". 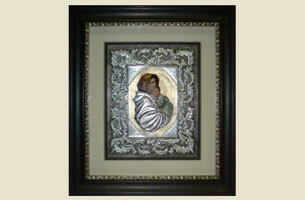 Hand-hammered metal that was then silver leafed and then hand painted with the portrait of the Madonna with Child. The piece was framed with a moire fabric covered mat, a dark wood inner filet and a 3" moulding. Museum glass was added to eliminate glare and reflection. Approximate size 24" X 30". Collection of baseball photographs of the 1964 St. Louis Cardinals, each signed by the respective team member and accompanied by a certificate of authenticity. The multiple opening, triple mat displays the team colors and the photos were arranged to reflect the players position on the team. Approximate size 32" X 32". 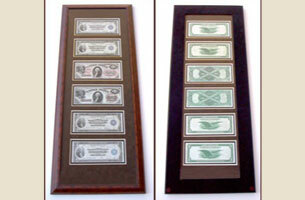 A collection of rare and antique dollar bills dating from 1865-1898. Framed in a burlwood moulding with triple opening suede mats on both the front and back so both sides of the note are viewable as well as protected. Approximate size 12" X 28". 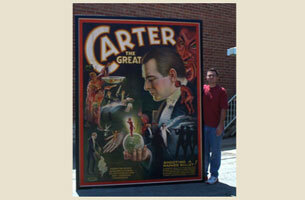 Large, antique announcment poster archivally mounted to canvas and stretched over bars. Frames with a 3" wide, black moulding to emphasise the time period of the piece. Approximate size 6ft. X 9ft.. Antique painting framed in one of our custom closed-corner frames. Approximate size 18" X 42". 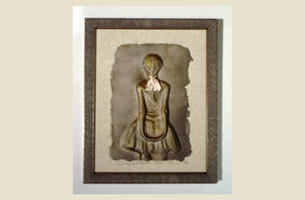 Hand-made paper embossing floated on a heavy-weave linen fabric and framed with a rich beaded bronze wood moulding. Approximate size 18" X 24".